Here it is, my faithful readers, let’s all just let out a long, much needed sigh. Tell you what, back in 2008, I was among the rest of you out there waiting for one of the most highly anticipated flicks of…not only the year, but ever. What series waits 20 years to make the next flick? And it’s a major franchise? How will it work!? I was practically pooping rainbows left and right in the theater as each preview ended, inching closer and closer to the film as it began. Open scene – Indiana Jones and the Kingdom of the Crystal Skull, yeah! John Williams’ classic score – yeah! CGI gopher…hmm Area 51…sigh. Indiana Jones is back in his big boy pants and a fresh pair of Depends, and he’s been dragged to Area 51 to help Russians find a box with what appears to be an alien inside – hey…where are all of those crazy workers at Area 51 that will shoot down intruders within 10 miles? I guess they have the day off. Anyways, good ol’ Indy gets away with it, and heads back home to keep on teaching. This young kid named Mutt (Shia LaBeouf) shows up and this is when the story of the Crystal Skull shows up, making Indiana quite interested – the skull was said to unlock some kind of unlimited treasure or power, and the Russians were after it. So was Indy – let the fun and Tarzan vine-swinging begin! When we began with the Indiana Jones series, we were introduced to an amazing story that we could all relate to, amazing sidekicks, and enough puzzles, action, and adventure to love with just a hint of comedy. Then the second one rolled around, which had a boring story and terrible sidekicks…but it still had some amazingly memorable scenes. The third one showed up, and again incredibly amazing story, great sidekicks…everything that was good in the first film showed up again here. 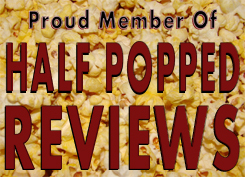 And then the fourth film…yeah. On the bright side – the pattern seems to be good, bad, good, bad…so that should give you a solid enough reason to ask for a fifth film…but there is also enough reason not to. Harrison Ford is old, folks. No way of getting around that one. The image of Indiana Jones is etched into our brains as this young, fit, attractive, funny, cunning man that can get himself out of any situation, because in a way…he’s like a superhero, costume and all. His age shows, ladies and gentleman, so in my opinion, that image of Indy is a little deteriorated. He wears his clothes a little too loose, and that baggy look doesn’t help his age, just makes him look older. His build is wrong, I hate to dog on an old guy, but it’s true. His movements have changed ever so slightly, but enough for the brain to catch…it’s noticeable. I mean, it’s like listening to FM radio on the wrong channel – I’m talking slightly off. It’s playing the same song, but you know something’s off. However…he sure gave it his all, and I will always respect him in the role, no matter what. Shia as a sidekick falls victim to what faltered in Temple of Doom, he’s annoying and when it comes right down to it, unnecessary. I usually like his characters, but for some reason or another, I just couldn’t connect with him at all. Marian, however, I had no issues with. The same goes for John Hurt. I liked their characters just fine. The story is what annoyed me the most here. For 20 years, Lucas and Spielberg couldn’t seem to agree on a story or script. There were rumors all this time of Spielberg introducing his alien knowledge in an Indiana Jones flick, but there seemed to be some sort of argument between the two if that was what was going to really happen. Well, after 20 years, nothing seemed to change, because right as the film begins…Area 51. At this point, I was sighing and shaking my head. Each time they made a reference to aliens – whether it be crop circles, or alien technology messing with your brain, or Roswell crash, or any of that…I was cringing. I don’t think an alien story fits whatsoever with the character of Indiana Jones. He is a tomb raider, not an astronaut. You can’t just throw aliens in a tomb and say it’s the same thing and fits, because it doesn’t. I have said before that it needs a story we all can relate to (Ark of the Covenant, Holy Grail) – something we know about. The simple idea of aliens is something we can relate to, but that’s not specific enough. Not only that, but we’ve seen it already 10,000 times. I’m trying to say this as simple as possible, it’s out of character. When I think Indiana Jones, half of the excitement into watching the movie comes from the soul, and what it makes me feel like while I watch it. A lot of how I felt was dread. I didn’t like the story and every reference to aliens had me groaning. I love Harrison Ford in the role, but I couldn’t help notice how old he looked. I didn’t really like Mutt, and then there is the issue with the Tarzen vine swinging…there’s a lot to criticize here. 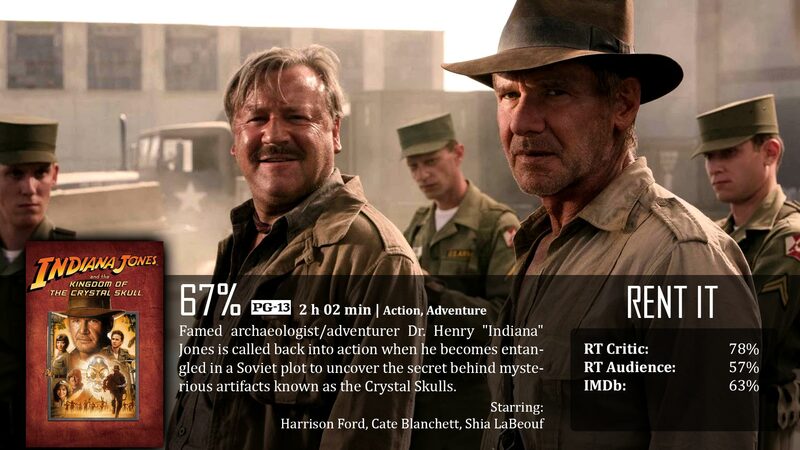 I was really disappointed in Indiana Jones and the Kingdom of the Crystal Skull. I haven’t seen this, primarily because I think it looks terrible. You’re certainly helping me to continue avoiding it. Sounds wretched.